The wedding cake is the pièce de résistance, or the masterpiece, of the wedding reception. It should be coordinated with the wedding theme and color scheme, and should represent the couples’ taste and style. For a stylish bride we recommend a white wedding cake with several tiers. This can be decorated in white or accented with one or more of the colors in the wedding’s theme. The more creative bride can work with our Italian pastry chefs to create a special design for her cake; at BeA Alfresco Wedding we once had a client who wanted her cake to be made to look like a suitcase, as the couple traveled a lot for both business and pleasure. The finished design of the cake was perfect, as it symbolized the beginning of the couples’ journey through life together. In Italy our pastry chefs make delicious cakes, whereas American cake designers are more focused on creating cakes pretty to look… but sometimes – forgive us for this parochial statement – not as good to eat as our Italian cakes are! At BeA Alfresco Wedding we try to take the best of both traditions – to create a wedding cake that is not only beautiful to look at, but also delicious. But in Italy we do things differently; if you arrange to have your wedding in Tuscany, we don’t usually offer a separate dessert, because in Italy the wedding cake IS the dessert – this is customary, especially as our cakes are so delicious that none of the wedding guests realize they haven’t had dessert as a separate dinner course, and are quite content to enjoy the wedding cake. There are so many traditional Italian cakes to choose from; Millefoglie cake (which consists of layers of puff pastry layered with Chantilly cream), vanilla or fruit-based cakes layered with fruit creams, rich dark chocolate cakes covered in ganache or a white chocolate cake filled with strawberries or raspberries, and cream. The list is almost endless; and is only limited by your taste buds! I am a food lover, so taste is important to me – be sure to have a tasting session of several flavors with our pastry chef before you make your decision. One popular idea is to have different flavored cakes on each tier of your wedding cake so as to give your guests a choice; or offer a cake made with beautifully decorated individual cupcakes stacked on attractive tiered plates – and you can even have a small regular cake placed on top for the ceremonial cutting of the cake by the bride and groom. 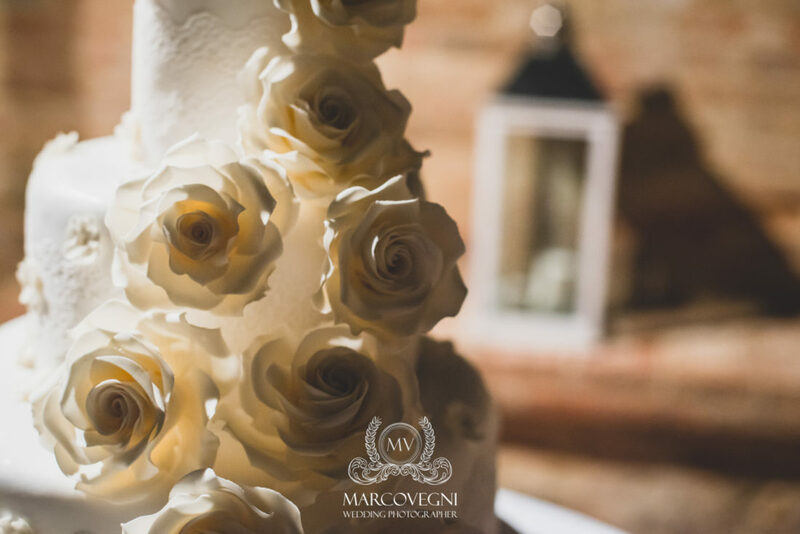 Whichever flavor or style you choose for your wedding cake we promise that we will combine design and taste to create the perfect cake for you!